My research paper entitled Towards high-reliability project organising in safety-critical projects has just hit the newsstands in the latest issue of Project Management Journal. High Reliability Organizations (HROs) claim to be special organizations, which have demonstrated consistently safe performance in operating environments which are simultaneously of high technical complexity, high consequence and high tempo. This paper argues that the literature on high reliability organizing, which emerged through studying day-to-day operations in the nuclear industry, air traffic control and US navy aircraft carriers, might hold important lessons for how the project management community can approach the management of safety-critical projects – projects in which safety is of paramount importance. Such projects might include the safe decommissioning of civil nuclear assets, the building of new nuclear power plants, the development of new oil and gas extraction facilities or the design of new aircraft engines. Much will be demanded of the individuals tasked with delivering these large-scale, complex and highly consequential projects. So what lessons can these individuals take from high reliability theory? And, how might high reliability organizing be realized in these safety-critical projects? The foundational research on high reliability organizations (HROs) was carried out in three particular organizations: the US air traffic control system (La Porte, 1988), electrical operations and power generation at the Pacific Gas and Electric Company (Schulman, 1993) and flight operations aboard two US navy aircraft carriers (Rochlin et al., 1987). Although the three original case studies were diverse in their activities, the researchers found similarities in that “they all operate in an unforgiving social and political environment, an environment rich with the potential for error, where the scale of consequences precludes learning through experimentation, and where to avoid failures in the shifting sources of vulnerability, complex processes are used to manage complex technology” (Weick et al., 1999, p. 32). Other common features were the high priority afforded to safety, hierarchical yet decentralized decision making processes, evidence of redundancy (both in equipment design and operating procedures), and strong organizational cultures that fostered openness, individual accountability and constant vigilance in anticipating and responding to potential safety threats (Roberts & Bea, 2001; Weick et al., 1999). 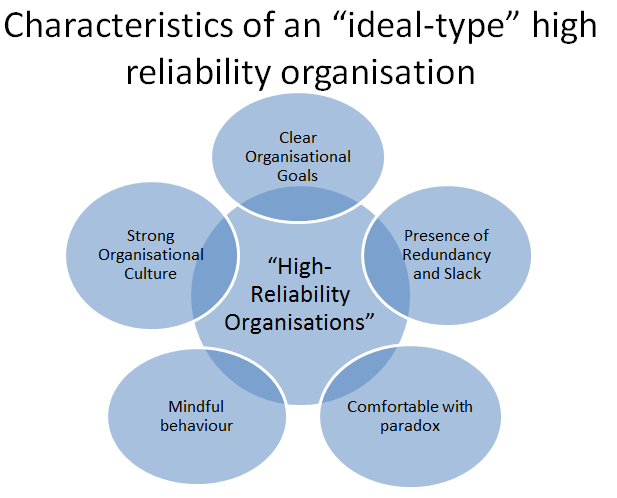 The following graphic shows the five key characteristics of an “ideal-type” high-reliability organisation. Empirical work is now underway to test these hypotheses on a set of case study projects in safety-critical industries to understand the extent to which the behaviours, organizational structures, and cultures associated with high reliability organizing can be evidenced in the ways of doing things of project management practitioners tasked with delivering safety-critical projects. 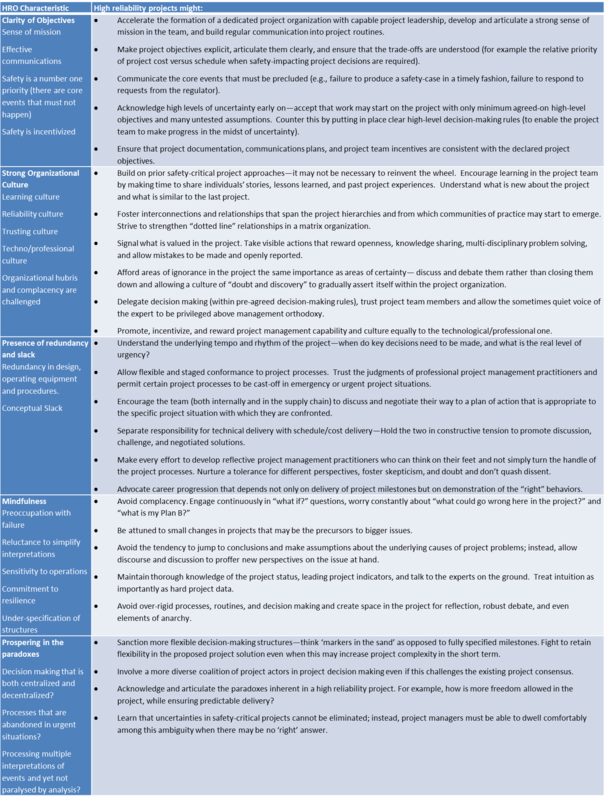 The contribution made by this study to the challenge of safety-critical projects is twofold: First the nature of the safety-critical project is explored and the similarities and differences between safety-critical projects and day-to-day operations examined. 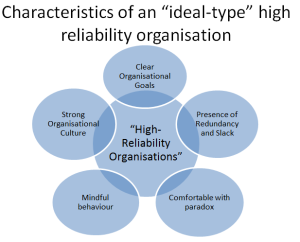 Second, the characteristics of an “ideal-type high reliability organization” are synthesized from the literature and used to hypothesize how the concept of high reliability project organizing might look and be adopted by project management practitioners tasked with delivering safety-critical project. It is important to note however that this research is at an exploratory phase and is not intended to be prescriptive. Rather I hope it will provoke new thinking around the management of large-scale safety critical projects. La Porte, T. (1988). The United States air traffic system: increasing reliability in the midst of rapid growth. In R. Mayntz & T. Hughes (Eds. ), The development of large scale technical systems (pp. 215-244). Boulder, CO: Westview Press. Roberts, K., & Bea, R. (2001). Must accidents happen? Lessons from high reliability organizations. Academy of Management Executive 15(3), 70-78. Rochlin, G.I., La Porte, T., & Roberts, K. (1987). The self-designing high reliability organization: Aircraft carrier flight operations at sea. Naval War College Review, 40, 76-90. Schulman, P.R. (1993). 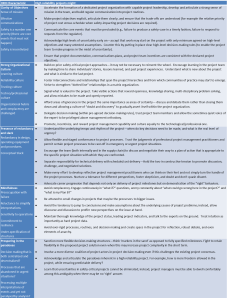 The analysis of high -reliability organizations: a comparative framework. In K.H. Roberts (Ed. ), New Challenges to Understanding Organizations (pp. 33-54). New York: Macmillan. Weick, K.E., Sutcliffe, K.M., & Obstfeld, D. (1999). Organizing for high reliability: Processes of collective mindfulness. In R.S. Sutton & B.M. Staw (Eds. ), Research in Organizational Behaviour, Vol. 1 (pp. 81-123). Stanford, CA: Jai Press.